The last thing Trump needs is someone as willing as him to start a war. So he appointed another draft-dodger whose known as a military hawk in Washington D.C. circles, and believes we need to do a preemptive strike against North Korea...soon. 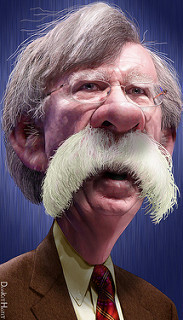 John Bolton is a warmonger and he's a damn sneak. It was Bolton's Super Pac that collaborated with Cambridge Analytica, and paid them for "research," on American voters. Enforcement officers from the UK's Information Commissioner's Office raided Cambridge Analytica's London offices, Saturday. The political consultancy company is accused of manipulating Facebook data during the 2016 US election, according to a report from an ICO spokesman. Cambridge Analytica was funded in part by Robert Mercer who was a pivotal supporter of Trump, donating millions to the campaign. A separate data team from Cambridge Analytica also assisted by Bolton's Super PAC, pushed for Trump’s election, Make America Number 1. Brad Parscale was the digital director of Trump's campaign, but Bolton's contributions can't be overlooked. The possibility of criminality being exposed is good. What else can't be overlooked is that Bolton is being empowered by our wannabe dictator, who has been feeling pretty hawkish himself lately.